Originally published at www.proaudioreview.com/jan01/sides/shure_ksm44-sidebar.htm; rescued from Internet obscurity 2010-07-27. With a gradual high-frequency rise between 4 kHz and 7 kHz, the KSM44 is a natural for a variety of vocal uses. Primarily, I used the microphone for close cardioid purposes, but in a few instances, I put its multiple patterns to the test. The first vocal sessions consisted of a lead male voice, a female ad-lib, and stacked male and female backing vocals. The lead vocal part was widely dynamic, consisting of breathy “up-close and personal” passages and a “power it home” out-chorus. Self-mic control was key to getting a good signal and appropriate tonal quality to tape, and the KSM44 helped out nicely. For the up-close sections, the singer moved right up to the pop filter, placed about two inches from the mic. This yielded an intimate feel, and the microphone’s proximity effect added desirable low end to the thinner breathy vocal. On the louder passages, the singer hit an on-axis mark about seven inches from the pop filter. The mic had no trouble handling the higher SPL sections. Since the high- and low-level vocal sections were so clearly delineated in the song, it was easy to ride the preamp gain to established marks, eliminating the need for compression on the way to tape. Several complete takes were laid to tape and comp’ed together afterward. The resulting composite vocal performance had a live and natural feel. The layered backing vocals were cut using a male and female vocalist, both singing into an omni-configured KSM44 from a distance of two feet. The two singers sang in unison, and each part was recorded twice. When the six tracks were panned across the stereo field, the product was a wide and lush three-part harmony. The use of the omni position added a nice overall ambience to the backing vocals that sets them apart from the lead vocal. A solo female response-type ad-lib was added during the out-vamp, completing the vocals for this song. Again, I used the KSM in cardioid mode, and the singer was about seven inches from the pop screen. I later tried the KSM44 for a type of recording in which I knew the microphone would excel: voiceovers. The voice talent was seated at a table with the 44 placed a few inches below his chin, angled up toward his mouth. No pop filter was used. The cardioid pattern rejected most of the reflections coming from the table; a thick absorptive pad on the table took care of the rest. I employed the KSM’s steep 80 Hz cutoff to take care of any unexpected rumble. The predictable result was a clean, full-bodied read with excellent clarity and intelligibility. For vocals over music — especially male vocals — the KSM44’s built-in high-frequency boost added the desired clarity and top needed to cut through a mix. No extra EQ was necessary. In a quick comparison, I found I could mimic the KSM44’s sound with a Neumann U 87 by adding a wide-Q 4 dB boost centered around 5 kHz; the sort of EQ I would add to a vocal track cut with the U87, in other words. In the case of this particular solo female ad-lib, the high-end boost turned out to be a bit much, especially in high SPL passages. A mid-Q dip in the same frequency range was needed to reduce the slight smear and essing on certain phrases. The layered background vocals went down like a charm; smooth and warm with no annoying microphone or room signature buildup. The distance from the KSM44 and the use of the omni position resulted in a sound I will definitely employ again. For voice-over and broadcast applications, the KSM44 should be a hit. 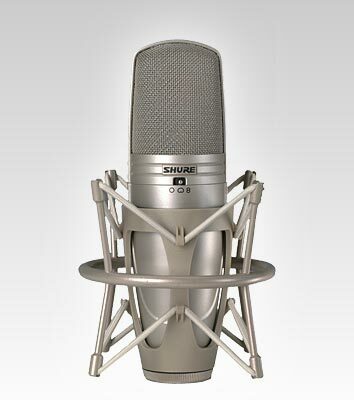 For voice-over and, presumably, broadcast applications, the KSM44 should be a hit. Its clean top end, internal subharmonic filter and low-noise/high-output specs make this mic a natural for commercial recording and broadcast applications. I consider the KSM44 an excellent “open-palette” mic — the sort that presents the engineer with a full-range, clean signal that can be easily enhanced or altered through user placement, patterns and settings. In other words, it provides the basis for a good recording. Stephen Murphy is the editor of Pro Audio Review. As a recording engineer/producer, he has worked on many successful audio and video productions, including Platinum and Grammy-award winning recordings. I love the shure microphone it sounds so good!!!!!! I use it on all my songs!! I love Shure!!! !